during the NASCAR Xfinity Series Alsco 300 at Bristol Motor Speedway on April 6, 2019 in Bristol, Tennessee. Christopher Bell was a winner, twice over, Saturday when he took the checkered flag in the Alsco 300 NASCAR Xfinity Series race at Bristol (Tenn.) Motor Speedway. He claimed his second series win of the 2019 season, and he simultaneously claimed the first of four $100,000 Xfinity Dash 4 Cash bonuses. Another driver eligible for the Dash for Cash bonus, Tyler Reddick, finished second, and a third, Chase Briscoe, was fourth. Cole Custer finished between them in third. Bell, as the Bristol bonus winner, and the other top-three finishing series regulars, Reddick, Custer and Briscoe, will be the four drivers vying for the second $100,000 bonus April 12 at Richmond (Va.) Raceway. Michael Annett, the final driver eligible for the Bonus at Bristol, finished eighth in the Bristol race Saturday. After starting the race in the eighth position, Bell, took the lead from Justin Allgaier on lap 226 and ran up front for most of the remaining laps of the 300-lap race. Allgaier had led 138 laps to that point, but soon after losing the lead to Bell, Allgaier was out of the race, due to a mechanical failure. Allgaier was up front at the end of both 85-lap stages that made up the first 170 laps of the race, taking the lead from Tyler Reddick on the final lap of the first stage after Reddick slowed, thinking the stage ended a lap earlier than it actually did. Reddick had been the leader since taking the position from pole sitter Custer on lap 26. Brandon Jones led several laps late in the race by staying out during the fourth and final caution of the race that came when Harrison Burton hit the wall on lap 260. But on lap 283, Bell retook the lead and Jones wound up making a green-flag stop for a flat tire. John Hunter Nemechek finished fifth. 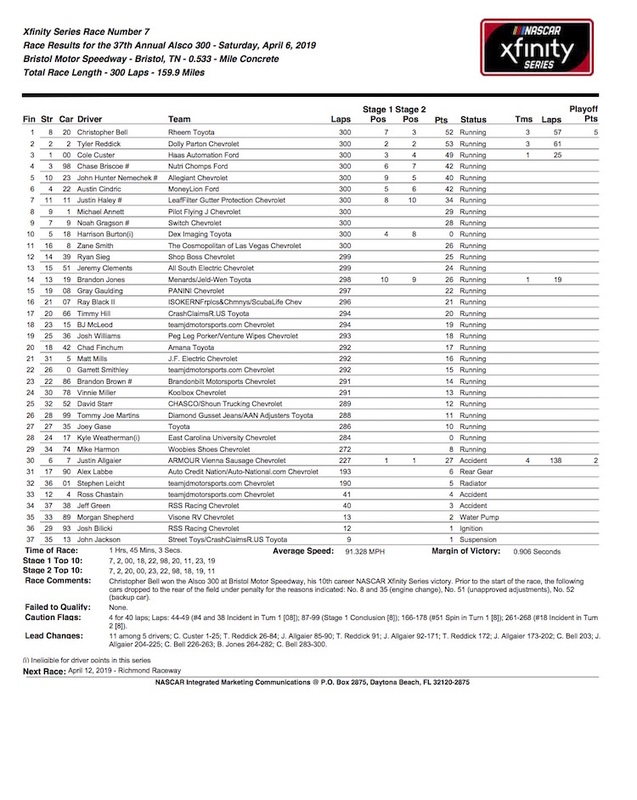 Other top-10 finishers included Austin Cindric in sixth, Justin Haley seventh, Noah Gragson ninth, and Burton was 10th in his Xfinity Series debut.